Tempeh Chili - Vegans Eat What? Vegans Eat What? This hearty chili is the perfect one dish meal. Heat the oil in a large soup pot over medium-high heat. When the oil is hot, sauté the onions and tempeh in the oil until the onions begin to soften. If necessary add a little of the broth to prevent sticking. Add everything else (except for the salt) and stir well to combine. Reduce the heat to medium-low and simmer, stirring often, about 35 minutes. Note from VEW: We sometimes substitute 1 cup TVP for the tempeh. 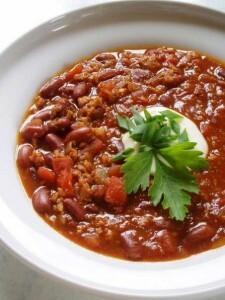 However you make it, this is one good bowl of chili!